There’s a desert garden in Tucson where their abundance of night-blooming cacti allows the botanical garden to sponsor a fund-raiser when gente flock to the garden for an all-nighter to ooh and uuy over the spectacle of flowers that open only in darkness and fade in daylight. I've taken to staying up late enough to uuy and ahh over my home-grown night-bloomers in Pasadena Califas. "Cereus" is a generalized name for any number of gorgeous cacti. "Queen of the Night," is another. They have distinct scientific names. I don't know many of those so I go by the shape or other significant denominator. My rat-tail cereus has begun to bloom with annual reliability. Last year she was covered with a dozen buds. This year she has only a few, three will probably make it. Of all the epiphyllum in my collection, this rat-tail and a flat-penca variety are the most magnificent blossoms and the most challenging to capture on digital film. They bloom in the early morning, like 2 a.m. But lately, that's been earlier. My practice is to photograph the blossom in situ. The plants are tough, moving a flowering specimen is not fraught with broken potential. But a large plant is heavy. And the elongated pencas of a mature specimen make moving an unwieldy process. And pencas are fragile, more so than flower buds. A remote shutter release is all I wanted for Christmas a few years ago. The remote is essential for reducing camera shake. The range of my device allows me to be inside the house and expose a frame outside on the driveway. The macro lens set at its smallest aperture, f/32, creates a sharp field of vision at the heart of the flower. Sharpness drops off acceptably into the distance, emphasizing edge folds of inner petals. The deep focus requires longer exposure time and that steady tripod. The Canon camera executes a precise focus in good light. In the dim light I anticipate here on the driveway, the camera will fail. I focus on auto then switch the lens to Manual focus, locking in the focus point. The camera will simply click now, focused on the spot where the rat-tail cereus bud is unwrapping. My mother had never seen this plant bloom, and there wasn’t a family memory of its flower, so she couldn’t tell me a thing about it. Most of my collection moved here when my mom moved in with us. The collection recently doubled when friends relocated to colder climes. The first time the rat-tail opened I discovered it at 7 in the morning, after it had collapsed. The next year she did not bloom. The next two years, she’s offered her magnificence. She’s in a new location this year and doesn’t mind the dislocation to more fully open shade. 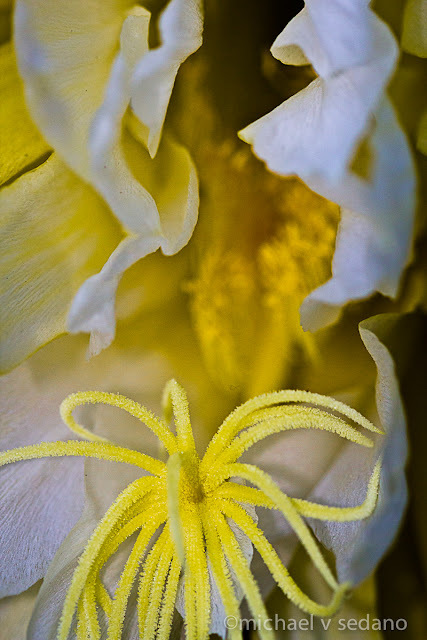 June 10th, a Sunday afternoon, the bud curled upward and began to spread the tips of her yellow calyx petals. I began intermittent exposures. Every ten or fifteen minutes, I pushed the button. Once I waited twenty minutes and discovered a spectacular beginning. 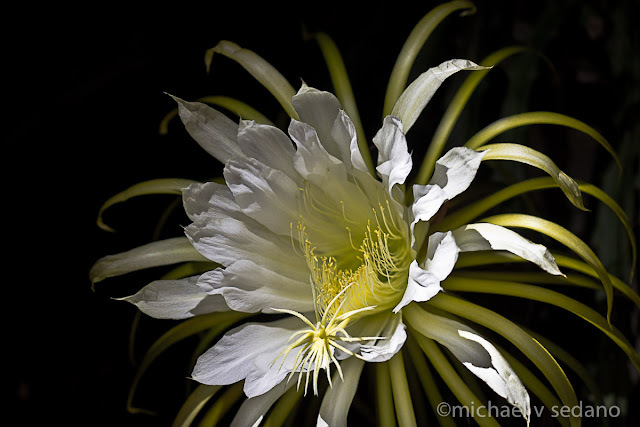 The rat-tailed night-blooming epiphyllum isn’t yellow, on the inside. When it first shows her heart, yellow gives way to creamy white. Supple folds ripple open to form the mouth of a deep trumpet. Inside, an array of golden filaments spills forth, foremost a sinuously elegant stigma beckons. A bat? A moth? Will some night-flying creature heed the enchantingly sweet perfume that fills the air within a few minutes after she exposes her inner heart to the world? She is a giant. Throughout the night she opens and stretches, pumps her nourishment filling the tissue of veins that give shape and form to her petals. With dawn’s light the forces of gravity and light and mass exceed the capacity of her veins and the flower collapses. Her ovum pollinated, she will bear fruit this year. If not, only beauty. Floricanto de los Delfines returns next week. 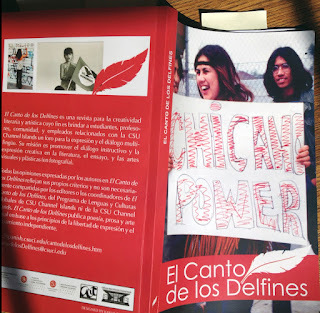 Canto de los Delfines, the literary journal of California State University Channel Islands, published its fourth annual edition to culminate the academic year. 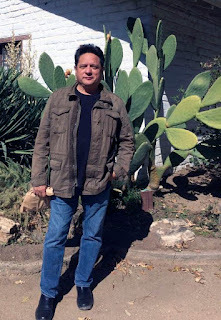 La Bloga is working with curator Oscar Castillo to share some of the journal's ekphrastic poems with Oscar's photographs. This special On-line Floricanto resumes next week. Denver's 3: A Taos Press, an independent press with a westward purview, publishes poetry, and more. Publisher Andrea Watson teamed with poet Karen Cordova to organize last year's peripatetic Route 66 floricanto held in Rowland, California and Taos, New Mexico. 3: A Taos Press announces its publication of Bird Forgiveness by Melinda Palacio, La Bloga's Friday bloguera. Click here for 3: A Taos Press' website. hija del sol y de la tierra. fue una madre adolescente, su suerte quedó marcada. ¿Qué misterios encierra tu corazón? ¿Jardín de rosas o cementerio? The war will have to wait. The war will have to wilt. Because I am from the belly button of the moon. Not anything having to do with the man in the moon. Look, my grandfather's fat toenail! The moon is Acteal tonight, bloodied Indian moon. a laugh that drives ghosts out of the living room. The moon is Ix, the jaguar that carries the stars on her back. just the pockmarks of standing in the way of the blows meant for her child. something terrible has to end. Not tonight, not any night, not tomorrow or ever. con cebolla picada and oregano Mexican. and make plans for el Día De Los Muertos. "¡Ey, pinchi Pol! ¡A donde vas Güey! en casa de mi tía ... Güey!" and this makes being American hella fun. 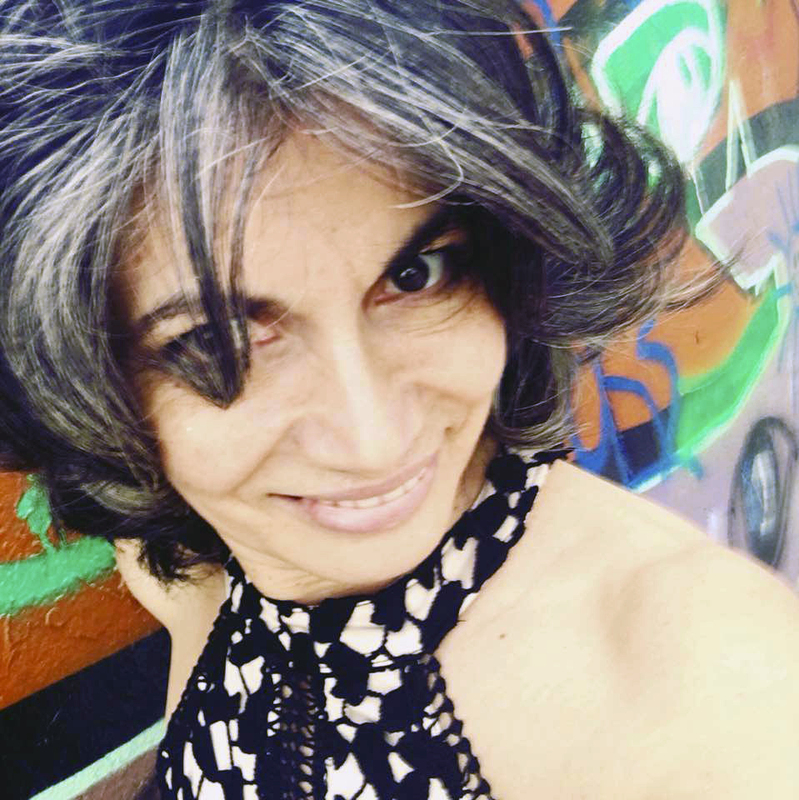 Norma Beatriz Sánchez, poeta mexicana. Miembro activo del grupo literario Escritores del Nuevo Sol desde 2003. Finalista del concurso de poesía en español, Colectivo Verso Activo. 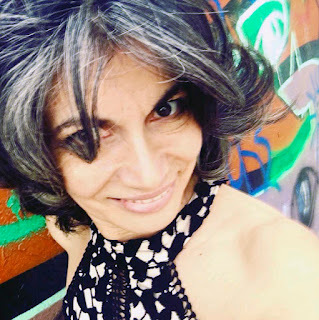 Sus poemas se han publicado en las antologías Voces y Cuentos del Nuevo Sol, The Border Crossed Us, Poesía en Vuelo, Soñadores; Mujeres de Maíz Zine 10 y 13, y St. Sucia, VI edición, así como en La Palabra, y Poetas Respondiendo a la la Ley SB1070. Dr. Donny Jackson is a lifelong poet, clinical psychologist, and Emmy-winning producer in documentary television. Paul Aponte is a Chicano Poet from Sacramento. 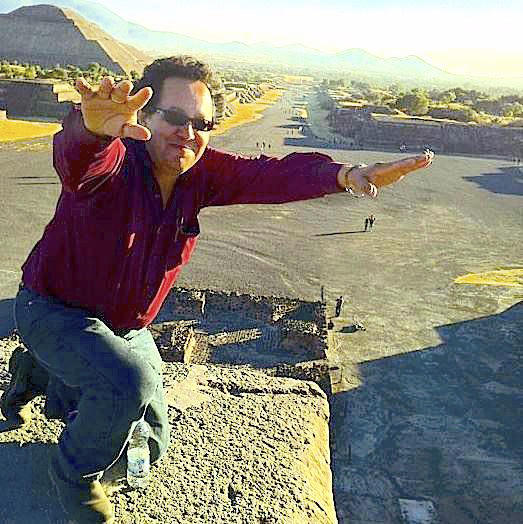 He is a member of the writers groups "Círculo" and "Escritores Del Nuevo Sol" (Writers Of The New Sun). 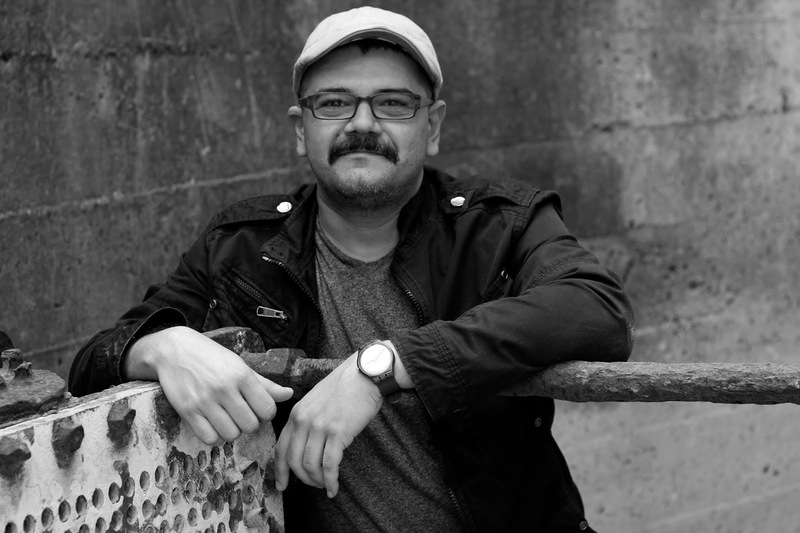 He has been published in El Tecolote Press Anthology "Poetry in flight", in the Anthology "Soñadores - We Came To Dream", and in the "Los Angeles Review Volume 20 - Fall 2016". He was also the editor's choice in the online journal "Convergence", and was published in Escritores del Nuevo Sol / Writers of the New Sun: Anthology. This new book includes an Escritores historical perspective by JoAnn Anglin, a forward by Lucha Corpi, many great writers/poets, and several poems by and also honoring one of its founders Francisco X. Alarcón. 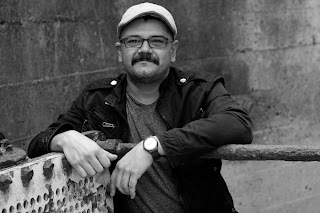 César L. De León is a poet-organizer for Resistencia: Poets Against Walls and a member of the Chocholichex Writers Collective. 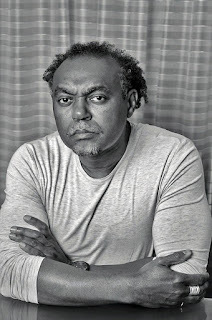 His work appears in journals like Pilgrimage, The Acentos Review, La Bloga and the anthologies Imaniman: Poets Writing in the Anzalduan Borderlands and Texas Weather, among others.